Just as an ice cold beer is the perfect match to a hot summer day, cool fall temps lend themselves perfectly to curling up on a couch with a glass of wine. This fall, consider adding a wine cellar to your home. You don’t need to be a wine expert to appreciate a good bottle of wine and you don’t need to build a new house to have a home wine cellar. At Closets For Life, our custom designed cellar creations are handcrafted to match your design and bottle capacity goals. Whether you are interested in just racking or a complete wine cellar, Closets For Life will transform an area in your home into the wine cellar you’ve always wanted. Calling us to arrange a free home consultation is all it takes to get started! 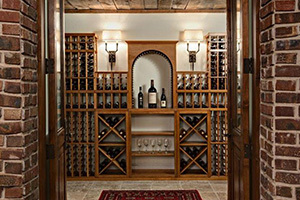 In the meantime, we’ve provided these links for wine cellar design ideas, remodel examples and photos. See how we’ve designed cellar creations, big and small, for homeowners just like you. 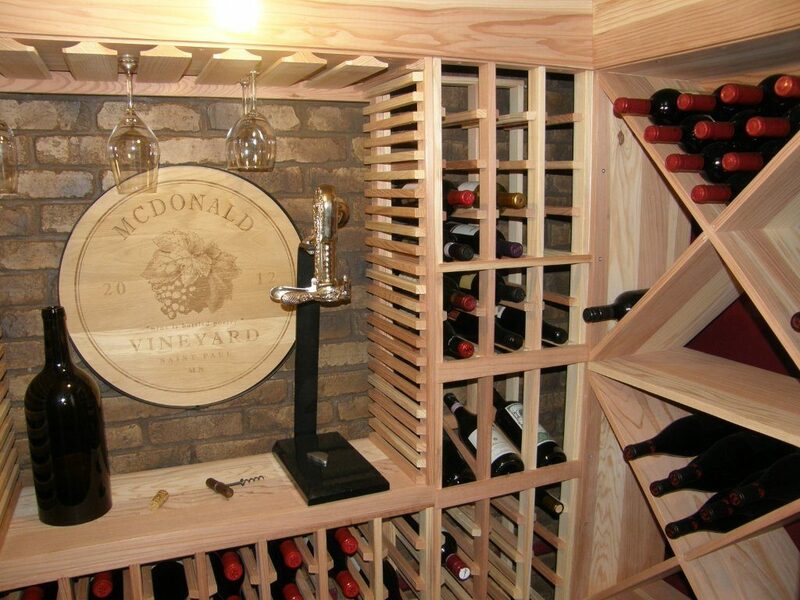 Visit our wine cellar project portfolio to see photos of wine cellar projects we’ve completed. 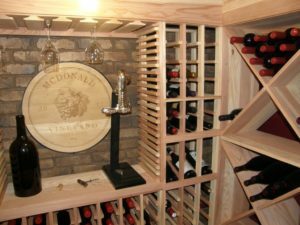 Read a previous blog and learn the unique story behind how a unique little wine cellar tucked under a staircase came to be. Visit us on Houzz to see before and after photos of a project where we transformed a spare bedroom into a wine cellar. Have a space in your home you think might be perfect for a home wine cellar? Based in Minneapolis, Minnesota, Closets For Life is a custom organization company that works with residential clients as well as designers, builders and architects to create innovative solutions to all of your organizational needs including wine cellars of all shapes and sizes. Whether your wine cellar dreams are big or small, Closets for Life will come out to your house for a free home consultation to help you design a wine cellar that perfectly fits your needs. Contact Closets For Life by phone at 952-484-0416 or by email at rlyrek@closetsforlife.com. Whether you love to entertain or enjoy a glass of wine with dinner, having a home wine cellar is a great idea. Think a wine cellar is too expensive or only for a serious wine connoisseur? Not true! Hear us out on why a wine cellar is a fabulous idea for anyone. Wine cellars are convenient: Having a well stocked wine cellar means you will have a bottle of wine when you need it. Sure, you can run out to the store and buy wine on an as-needed basis but having a supply of your favorites is so much easier. Just a grab a bottle for last minute dinner plans at a friend’s house or a romantic dinner at home. One less errand to run. It’s easier than you think : We stumbled across a fun blog, www.BlogYourWine.com written by Kris Chislett. His blog is informative about wine, yet approachable and humorous. He points out that you don’t need a huge amount of space to have a wine cellar. 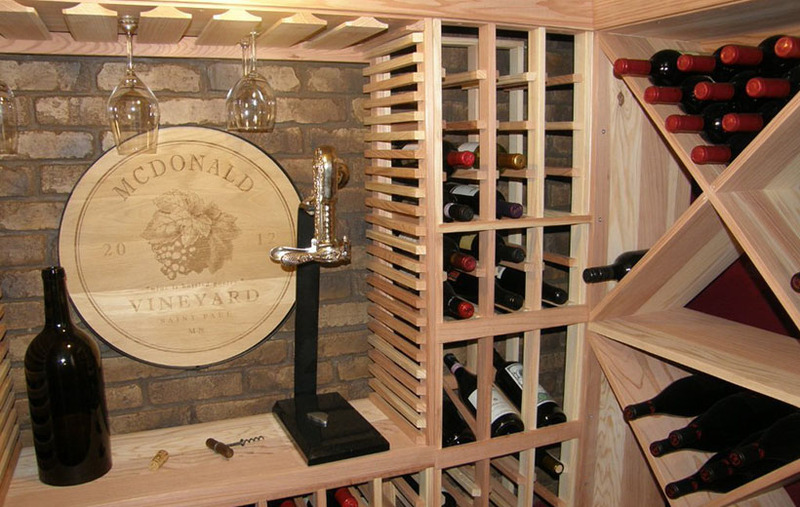 Having a custom wine cellar built in your home is wonderful but it doesn’t have to be that way. You just need somewhere that is out of direct sunlight, away from any amount of vibration and in the coolest part of your house. Add wine racks and, ta-da!, you have can have a wine cellar. Collecting is fun: Collecting wine can be fun! On Blog Your Wine, Kris suggests buying a few bottles of a wine considered ‘age-worthy’ and conducting a fun experiment. Buy a few bottles, and drink them over the course of a few years, taking notes along the way. You don’t have to be a millionaire to do it, and it’s a great way to experience what even just a little bottle age can do to a wine. Another site suggested buying bottles of wine released in the year your child was born and then saving it for their 21st birthday. A wine cellar will save you money: It’s a well known fact that its cheaper to buy wine by the case. Having the proper place (like a wine cellar) to store larger quantities of wine will save you money in the long run. 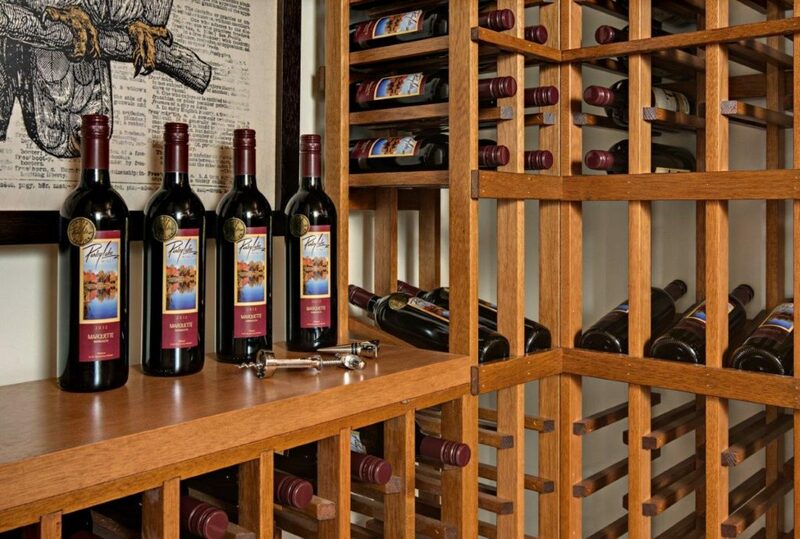 If a home wine cellar is in your future, we can help. Based in Minneapolis, Minnesota, Closets For Life is a custom closet company that works with residential clients as well as designers, builders and architects to create innovative solutions to all of your organizational needs including home wine cellars of all sizes. Whether you are interested in wine racks or a building complete wine cellar, Closets for Life will come out to your house for a free home consultation to help you design a wine cellar that perfectly fits your needs. Contact us to see what we can do! Whether you have a home wine cellar, are dreaming of a home wine cellar or just love to drink wine, you don’t need to be a sommelier to be able to smoothly navigate the sometimes overwhelming world of wine. There is a growing collection of apps for your phone or tablet that can help you with everything from managing your home wine cellar collection to recommending the right wine to pair with food. We’ve compiled a list of 4 apps that will appeal to wine enthusiasts on all levels, allowing everyone to take advantage of the berth of information available online. Scan a photo of any wine label and instantly learn that wine’s rating, review, and average price. This app also allows you to track and rate the wines you choose and compare your ratings with friends the Vivino community. What’s more, once you rate three wines, the app will start recommending bottles for you to try. A great app to use when your looking to explore a new wine or standing in the wine isle overwhelmed by the choices. It’s like having a wine expert at your virtual side. Hello Vino provide recommendations for every occasion – from the best wine to pair with food to the appropriate wine for specific holidays or celebrations. The app also tracks and makes suggestions based on your personal taste preferences. Appear ‘wine-worldly’ at your next dinner party by serving a wine paired for each course! It also let’s you use the app “in reverse” by suggesting meals and selections based on the wine you already have on hand. Track and organize the contents of your home wine cellar with this simple and powerful app. The app also allows you to view your wine cellar by style, region or favorite, prices and more. With thorough entering of details from the wine bottle, this app will also help you gauge whether a bottle is ready to enjoy or would benefit from some longer time to age. Although it costs $2.99, this app is priceless for the home wine cellar collector. This app is the equivalent to a wine Magic 8 Ball. App users complete a ‘taste interview’, answering questions about their salt, coffee, beer and cocktail whims. The app then uses those answers to hone in on the user’s personal flavor preferences. Based on the interview, WineQuest claims it can predict if you’re going to love, like, or simply hate a wine. It’s worth getting this app just to find out if it’s right. 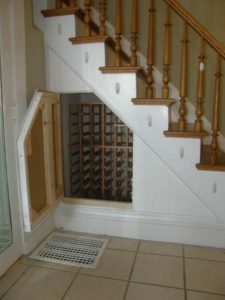 Last month’s blog was about a popular photo on our Houzz page featuring a unique wine cellar tucked under a staircase. This month, we completed a large custom walk-in wine cellar project with stone floors, mahogany racking and over 900 bottle capacity. It just goes to show that wine racking and home wine cellars can come in all shapes and sizes. The Perfect Home Wine Cellar Solution for You! Whether you are an avid wine collector or just someone who likes an occasional glass of wine there are many advantages to having a home wine cellar (see our previous blog on this!). However, we frequently run to many people who believe they don’t have the space for a home wine cellar. This simply isn’t the case. A wine cellar can be as simple or as extravagant as you want as long as it reduces the wine bottle’s exposure to light and heat. We have completed many wine cellar projects in all shapes and sizes. 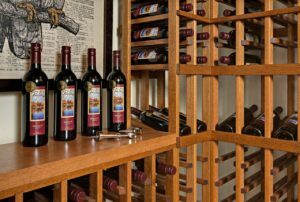 Check out our home wine cellar project gallery to see examples of home wine cellars Closets For Life has designed and installed. You just might find the wine cellar you were looking for! Have a little space in your home that you think might be perfect for a home wine cellar? Based in Minneapolis, Minnesota, Closets For Life is a custom organization company that works with residential clients as well as designers, builders and architects to create innovative solutions to all of your organizational needs including wine racking and wine cellars of all shapes and sizes. Whether you are interested in racks or a building complete wine cellar, Closets for Life will come out to your house for a free home consultation to help you design a wine cellar that perfectly fits your needs. Contact us to get started! The homeowners were remodeling several areas of their home including the staircase. A day after the staircase was completed, the homeowners heard a meowing sound but couldn’t find their cat anywhere. After much confusion, the homeowners realized the cat was trapped in the area under the stairs! With all the noise and activity from remodeling, the cat had been hiding for much of the time. He must have found a great hiding spot under the stairwell and they unknowing walled him in under the stairs! There wasn’t any way to get the cat out other than cutting into the newly finished wall to access the space under the stairs. Once the cat was free, the homeowners were left with a large whole in the staircase wall. They could have just fixed the hole but they brainstormed up even a better idea to use the otherwise wasted space as a wine cellar. Talk about turning lemons into lemonade! The homeowners contacted us to design and install the door and wine racks. Viola! The wine cellar a cat built. You don’t need a stuck cat to build the wine cellar of your dreams. Based in Minneapolis, Minnesota, Closets For Life is a custom closet company that works with residential clients as well as designers, builders and architects to create innovative solutions to all of your organizational needs including wine racking and wine cellars of all sizes. Whether you are interested in racks or a building complete wine cellar, Closets for Life will come out to your house for a free home consultation to help you design a wine cellar that perfectly fits your needs. Contact us for a free in-home consultation today!